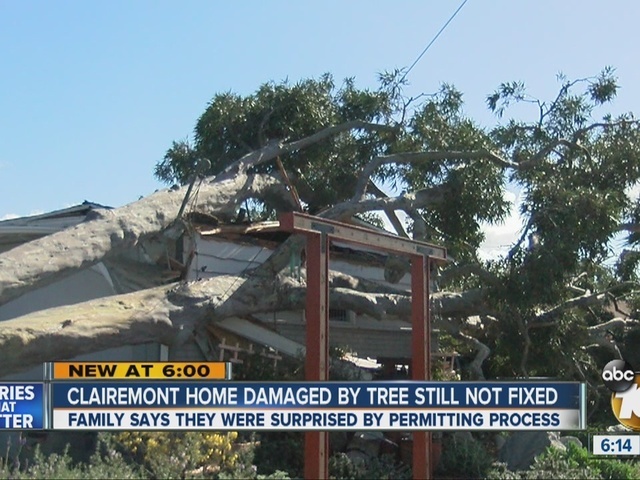 A Clairemont family said they are surprised with some of the city of San Diego's requirements after a tree destroyed their home. It's been six weeks since El Niño's fierce winds forced a massive eucalyptus tree to topple onto Mark Nickell's home. With the home still damaged, the family is continuing to live in a hotel. The eucalyptus tree that used to shade Nickell's childhood home was now resting on top of it. The tree couldn't withstand the storm's high winds. "It was just constantly cranking. I hardly didn't get any sleep; never heard it like that before," neighbor Larry Fezer said at the time. Neighbors came together to remove the tree from the house. It's now gone, but much of the home remains in disrepair. Inside the garage, a massive home created an unwanted skylight, exposing wooden spikes. "One of our concerns is someone coming up to the structure as it stands right now and getting hurt," said Greg Clark, Nickell's brother-in-law. Nickell and Clark applied for permits to rebuild the garage, but some of the city's requirements, including one for a historical review, caught them off-guard. "We're just trying to restore the house to the condition it was prior to the damage of the tree," Clark said. City records show they submitted their plans on Friday. Homes over 40 years old need a historical review, but a city spokesman said people can quicken the process by explaining their emergency situation, such as if they're unable to live in the home. That's the case for Nickell and his mother, Constance, who share the Clairemont house. They're staying in a hotel, paid for by their insurance policy. "It's a nice place, but it's not home," Nickell said. "My mom is really depressed, I'm very stressed, we just want to come back here." The city spokesman said officials signed off on the historical review Monday. The spokesman said the best way to communicate an emergency situation is to explain the agent who processes the permit application.